The latest number of Field Exchange, a journal published by ENN, contains a summary of a recent research paper describing how to use “Linear programming to design low cost, local RUTF” with the aid of Microsoft Excel software. 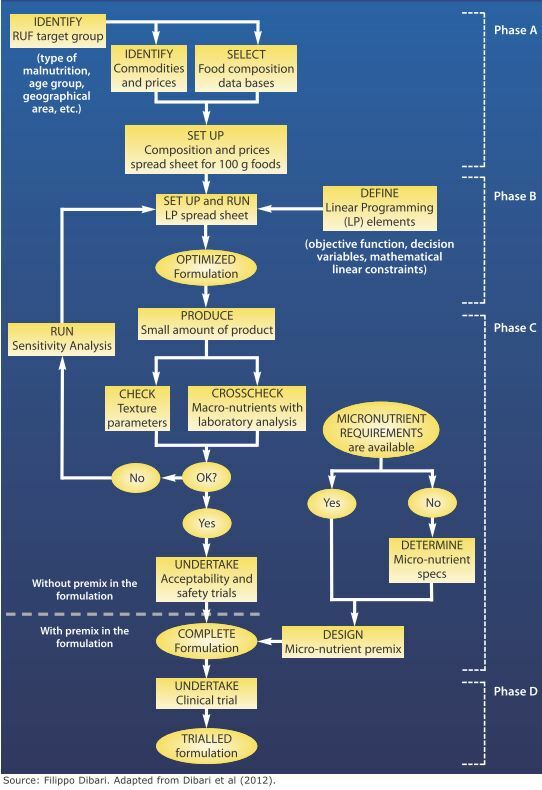 Whereas the original paper abstract can be found on The Journal of Nutrition web site, in the Field Exchange journal (issue 43, part 1), the article summary is available (for free) at page 36, including an “adapted” flow chart with the step sequence proposed for the design (see beneath), the pre-testing and the trialling of these products, currently in high demand in feeding programmes around the world. The authors of the original paper are Filippo Dibari (author also of this blog), El Hadji I. Diop, Steven Collins, and Andrew Seal from Valid International and the University College of London. More information about the Linear Programming, applied to the field of nutrition, is also available from another post in this same blog.